It’s finally here! After days of online rumours, obviously Photoshopped mockups and tantalising social media posts, Nintendo has finally posted a Mini Nintendo Direct online. This time, it deals with various Nintendo Switch games being released in the first months of 2017, including DLC for titles like Super Mario Odyssey. As you can tell, there’s actually quite a bit here given how little notice we were given about the whole affair. There’s a new Mario Tennis game, DLC for Mario Odyssey and Mario + Rabbids, various third-party game trailers and quite a bit more besides. Yeah, it’s not E3 level, and a far cry from any of the more advertised Directs… but it’s something to quench the thirst driven by the sheer lack of Nintendo news in recent days. Yup, you heard that right. An all new, improved version of the World Ends with You on Nintendo DS is now heading over to the Switch, and will be available to buy this year. It’s not a huge remake and doesn’t add dozens of features, but it’s still nice to see none the less. Especially given how, well Square Enix has basically ignored the game for the best part of a decade (not counting the one mobile port three or four years back). Following on from that we then get Pokken Tournament DX news. Namely, the news that DLC characters will be coming to the game later this year. This translates to two packs of content, each with a new playable Pokemon fighter and two support characters go with them. Pack 1 has Aegislash as playable, as well as Mega Rayquaza and Mimikyu as support characters, whereas pack 2 as Blastoise as a fighter as well as Mew and Celebi in support roles. And both new characters are pretty cool to be honest. 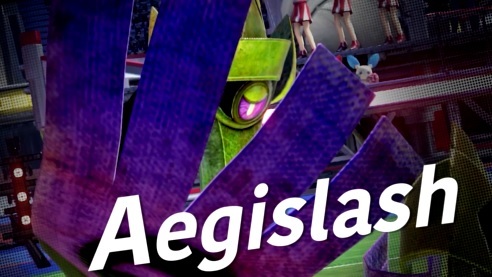 Aegislash is an interesting Pokemon in the original series, with a clever stance change system likely opening up various possibilities, whereas Blastoise is a long-time fan favourite on par with Charizard and Mewtwo. Add to this how the new characters aren’t being introduced to the arcade version first, and well, it seems the developers have finally started treating the Switch version like the primary platform for the title. Still, enough about the ports for no. Cause as everyone predicted, Kirby Star Allies got a new trailer in the Direct too. This time, focusing on new abilities like the Spider and Artist abilities, as well as the combined ones that let you merge two abilities into one. It’s a pretty neat addition to the Kirby series, especially given how artist creates hilarious handdrawn versions of classic friends and foes to fight alongside you. Definitely looks like one to check out for Kirby fans. Heck, it even has a likely fan favourite villain in the style of Marx and Magolor to encounter too! But hey, onto the new game in the presentation now. This time, it’s a port of Hyrule Warriors for the Nintendo Switch, complete with all DLC content from the past versions being included by default. It’s a neat deal for those who don’t own the game, but to be honest, it kind of leaves us feeling a tad disappointed overall. Why? Well from the trailer, it doesn’t really seem to do anything new with the idea. It’s Hyrule Warriors, it includes the content from before, and it’s on a new system. That’s it. There’s nothing else to see here. And in a world where Mario Kart 8 Deluxe introduced a brand-new battle system and Pokken Tournament introduced new fighters… that’s perhaps not quite good enough anymore. A Switch version would have been the perfect time to bring Breath of the Wild elements into the ‘franchise’, yet Nintendo just ported the thing over and called it a day. Like this surprisingly interesting looking Mario Tennis game. 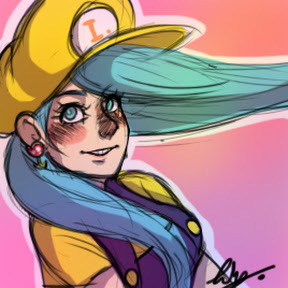 I mean, you remember Mario Tennis Ultra Smash, don’t you? That Wii U game that was rather bland because of its uninspired characters, courts and gameplay options? Which is why we’re happy that Mario Tennis Aces looks nothing like it. Gone are the lack of modes, in their place a brand-new story mode with enemies and bosses to fight along the way. Gone are the Wii U game’s lack of charm on the characters, with everyone seemingly have unique designs to go along with the sport now. And as far as general presentation goes, everything’s took a massive step forward there too. 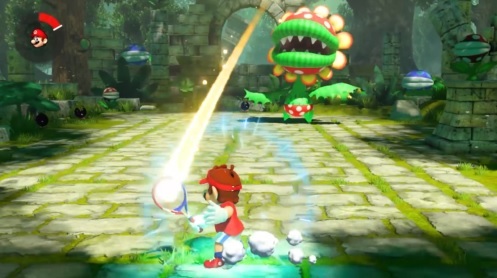 Damn, that ruins area with Petey Piranha looks bloody great for a Mario sports game, and the rest of the story mode seems quite ambitious too. So, it’s definitely one to look forward to, even if it’s not quite on the level of the N64 game or Power Tennis just yet. However, despite the new games and ports, that doesn’t mean existing Switch titles are being left out here. 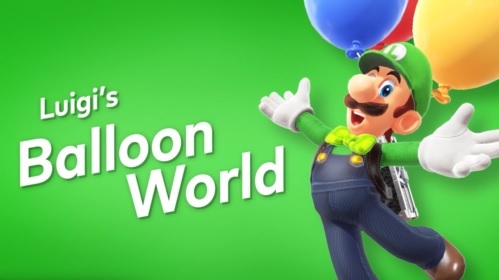 Oh no, Super Mario Odyssey is getting free DLC later this year too, which adds a new mode called Luigi’s Balloon World to the formula. It’s… an interesting concept. Basically, you get 30 seconds to hide a balloon anywhere you like in one of Odyssey’s kingdoms. Then, others players can take on your challenge online and try and find said balloon themselves, with players getting coins in both situations. In Nintendo’s own words, it’s pretty much a challenge run setup for the game, with each balloon being like a mini speedrun. It’s a creative concept, and it’s certainly rather unexpected as a result, especially given all the interest in Luigi as a playable character. However, we’re not quite sure whether it’s the best one for this point in time. After all, Luigi being playable would have a lot more appeal to many people, and general new content ideas like extra levels or Moons probably would gotten more hype than this thing would. Still, it’s a freebie, and with the speedrunning scene getting so advanced in recent months, likely one that’s going to offer quite a lot of replay value for Mario fans everywhere. 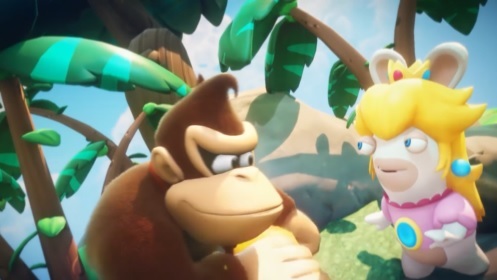 Aka Donkey Kong being a new playable character in Mario + Rabbids Kingdom Battle. Can’t say much about this one, other than that he seems like he’ll be fun to play and that his intro trailer is every bit as good as you’d hoped it’d be. And hey, talking about Kongs… guess what other game is coming to the Switch? Yeah, Donkey Kong Country Tropical Freeze! It’s a great game to see on the Switch, especially given how it’s original Wii U release date kind of screwed it over. But it’s not hitting the Switch unchanged. Oh no, the game’s got a new character to play as that acts like an easy mode. Oh yes, he’s now gone from shopkeeper to playable, just like Cranky Kong did before him. 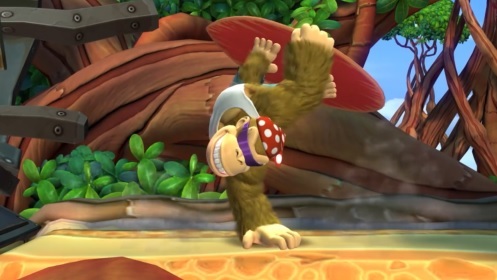 And also, just like Cranky Kong, Funky’s actually one hell of a badass when he’s playable too. He’s got infinite corkscrew charges underwater, doesn’t need an air meter to breath, can do fancy tricks with his surfboard and even ride the latter across spikes without being harmed. In other words, he’s the god mode guy everyone thought he’d be in the olden days. If you’ve missed out on it, it’s definitely a game to check on its release this May 4th. 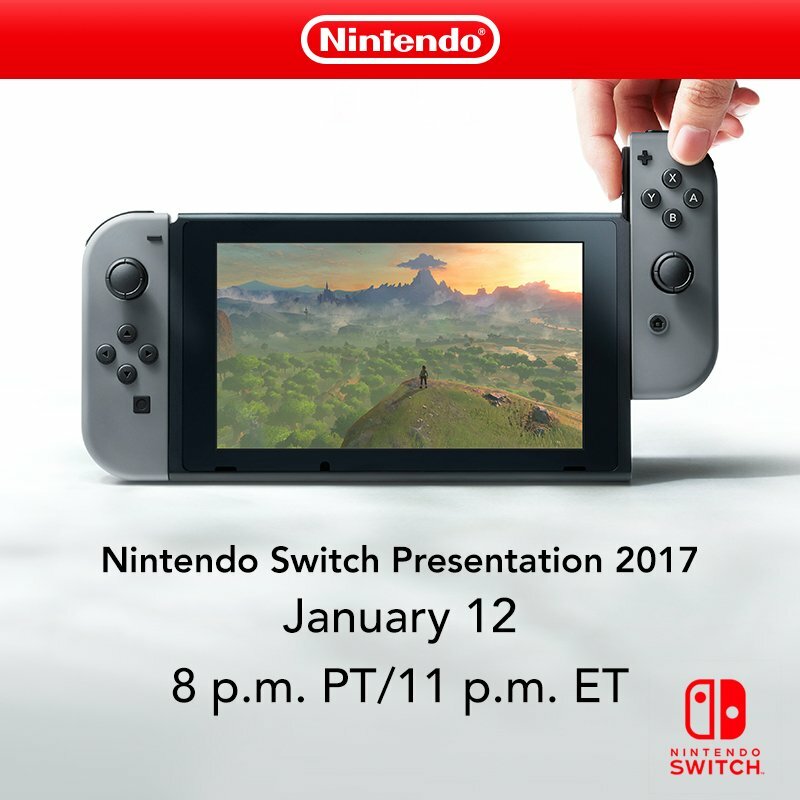 Which brings us to the last big announcement of the Direct. The one no one saw coming (unless they follow known video game leakers on YouTube). Yes, it’s real. 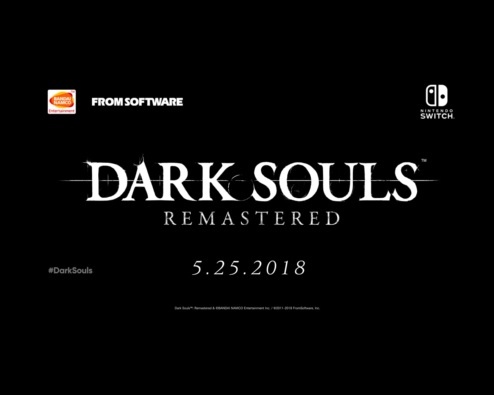 Dark Souls is getting remastered for the Nintendo Switch. There’s not much to say about this one. It’s Dark Souls, it’s a good game and it’ll be a damn good experience if you’re into that sort of title. It’s also likely not going to be the last Dark Souls game to hit the Switch either, since while only the 1st game’s remaster has been announced, one of Laura Kate Dale’s sources on Kotaku indicates that Bandai Namco intends to bring all three to Switch at some point. So, if you want the full Dark Souls experience… you’ll soon be able to have it on a Nintendo system. It’s a good selection for the start of 2018, and a real indication the Switch’s second year could be every bit as great as its first. But hey, what do you think of it all? Did you like the announcements at today’s Nintendo Direct? What games excite you most based on what you’ve seen here? Have your say here in the comments or on Gaming Latest’s forums today! Let’s Interview Mario Modder, Challenge Gamer and YouTuber Mayro! Let’s Compare… Nintendo Switch Leaks and Predictions!